To carry out research, observation, and monitoring to support, to the maximum extent practicable, the long term sustainability of the ecosystem, fish stocks, fish habitat, and the recreational, commercial, and charter fishing industry in the Gulf of Mexico. Management of, and restoration activities within, the Gulf of Mexico ecosystem are guided by this ecosystem understanding. The NOAA RESTORE Science Program is managed by the National Oceanic and Atmospheric Administration (NOAA) in consultation with the U.S. Fish and Wildlife Service. In addition, the RESTORE Act directs that the Gulf of Mexico Fishery Management Council and the Gulf States Marine Fisheries Commission be consulted as the program is executed. The Program is housed in the National Ocean Service, National Center for Coastal Ocean Science (NCCOS) with a Gulf-based program director to keep the program grounded in the region. The RESTORE Act stipulates that Program funds be expend “with respect to the Gulf of Mexico”. To provide geographic boundaries for the Program, the Gulf of Mexico ecosystem is defined as the ocean basin bounded by the United States along its northeastern, northern, and northwestern edges; Mexico on its southwestern and southern edges; and Cuba on its southeastern edge. The Gulf of Mexico is connected to the Caribbean Sea through the Yucatan Channel between Mexico and Cuba and connected to the Atlantic Ocean through the Florida Straits between Cuba and the United States. 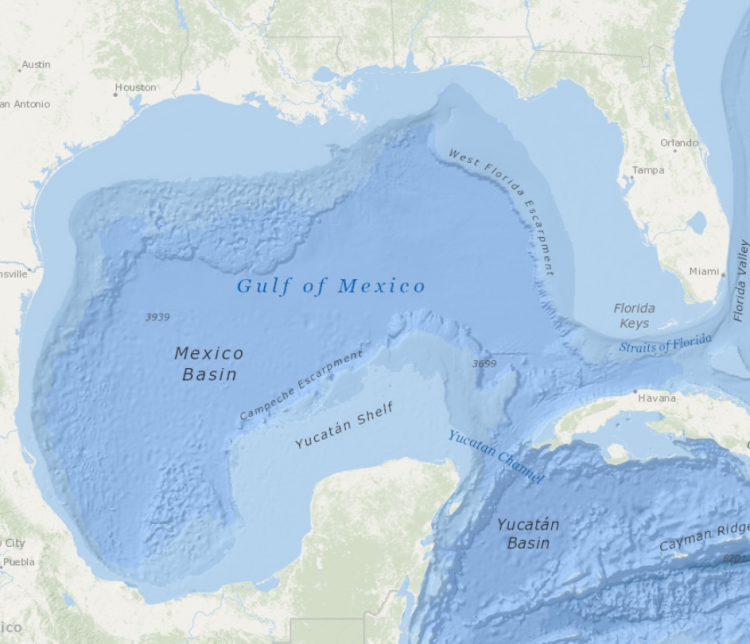 This definition of the Gulf of Mexico ecosystem includes the estuarine and marine environments of the basin´s continental shelf and its deep water environments. International, federal, and state waters are encompassed within this defined area. In addition to supporting research conducted in the Gulf of Mexico, the Program will also support research on processes that impact the Gulf of Mexico in a direct, significant, and quantifiable way, which includes processes in the watersheds draining into the Gulf of Mexico and coastal terrestrial areas that provide habitat for important wildlife species. The NOAA RESTORE Science Program maintains strict adherence to the principles of scientific integrity as defined in the NOAA Administrative Order on Scientific Integrity (NAO 202-735D). NOAA RESTORE Science Program staff and scientists funded by the Program are responsible for abiding by the principles contained in the NAO. Eligible applicants awarded funding under the NOAA Restore Science Program will be required to comply with NOAA´s Administrative Order on Management of Environmental Data and Information (NAO 212-15), which states that environmental data are to be managed based upon a lifecycle that includes developing and following a data management plan. Environmental data and information collected and/or created under an awarded grant/cooperative agreement will be made visible, accessible and independently understandable to users in a timely manner (typically no later than two (2) years after the data are collected or created) free of charge or at minimal cost that is no more than the cost of distribution to the user, except where limited by law, regulation, policy or by security requirements. To be successful, the NOAA RESTORE Science Program must harness the expertise of the research community working in the Gulf of Mexico and link it to the science needs of the region´s resource management community. An engagement process that connects researchers, resource managers, and resource users and allows their collective knowledge to inform the direction of the Program is required. NOAA, working with our U.S. Fish and Wildlife Service partner, have been conducting such a process from the beginning. NOAA and the U.S. Fish and Wildlife Service have already held over 200 meetings with stakeholders including representatives from the Gulf States Marine Fisheries Commission, Gulf of Mexico Fishery Management Council, universities, federal and state agencies, and non-governmental organizations. The Program has also engaged with stakeholders at research and resource management conferences and workshops and through virtual engagement sessions on-line. The input captured through this engagement shaped the Program´s science plan.